Compared to the monster truck rally GOP debates so far, the first Democratic primary debate was somewhat civil and informative. There was no blatant racism or sexism and CNN’s Anderson Cooper kept some semblance of a system. It resembled an actual debate as opposed to a WWE Extreme Cage Death Match where 15 clowns enter and one buffoon leaves. The GOP debates required alcohol to endure the blind, destructive, plastic rhetoric. 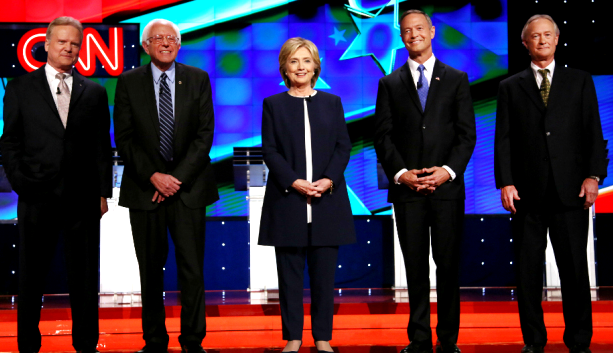 The Dem debate could actually be considered thought-provoking, as opposed to thought suppressing. Jim Webb, while candid, is clearly insane, although I do trust him to destroy ISIS with his bare hands. Sen. Lincoln Chafee demanded to be taken to McDonalds before going back to the nursing home. Hillary Clinton went backstage to shed her skin for a fresh one. Bernie Sanders left screaming and throwing his hands in the air, threatening to strangle Karl Rove with his bare hands. So it was still pretty entertaining. What is especially funny is I only just now remembered the existence of Martin O’Malley, who held his own, despite being carted in from a wax museum (the same one most GOP candidates come from). While Web, O’Malley, and Chafe all fought valiantly to be taken seriously, they were clearly not pleased with being on the stage exclusively because they aren’t Hillary Clinton. But if Hillary Clinton should be president because she is a woman, then maybe they should be up there just because. Anything goes, apparently. In the future our democratic system will be combined with “American Idol,” the natural evolution of our society.